If you are migrating from an existing RFA installation, you may skip to Migration. By default, the RTW RMDS (RFA) engine uses the Windows Registry for configuration. An example registry file is provided in the install directory, which is by default C:\Program Files (x86)\Vistasource\RTW\4.5. In Windows 7, run c:\WINDOWS\SysWOW64\regedit.exe, which is the 32-bit Registry Editor, and then do File→Import of the RFA-example.reg, which is located in the install directory. In Windows XP, browse to the install directory and double-click on the file RFA-example.reg to import the sample settings into the Windows Registry. See RTW RFA Configuration Editor on how to edit RFA configuration. This section provides information about editing the RTW RMDS (RFA) engine configuration options using the RTW rtconfig Editor. The options are located under the RMDS (RFA) tab of the Rtconfig Editor dialog, and correspond to those found in the rtconfig file located in the installation directory. To manually edit the RMDS (RFA) engine configuration options in the rtconfig file, see Manually Editing the rtconfig File. To edit the RTW RMDS (RFA) rtconfig settings, select Vistasource → Settings → Rtconfig Editor and then select the RMDS (RFA) tab. Refers to the rtconfig file option “rmds2_DefaultSession”. RFA configuration works by specifying Session components, which in turn specify one or more Connection components. A Session is a “configuration context” which the engine uses to connect to RMDS Market Data. A Connection specifies an RMDS connection type such as SSLED or SASS3. If no session is specified in the real-time formula, the engine will use the session specified here as the default RFA session. If no default session is specified, “RTWSession” is used. For more information about editing the RFA configuration, see RTW RFA Configuration Editor. These RFA configuration settings depend on your Reuters installation. Vistasource strongly recommends that you consult the Thomson Reuters manual for more information. Refers to the rtconfig file option “rmds2_UserConfigDatabases”, which specifies the user-defined RFA configuration database names. Most RFA configuration information must be specified in the “Default” namespace, but Connections and Sessions can also reside in user-defined namespaces. This list is automatically created based on your configuration. When using the Windows Registry, the user-defined namespaces are found under: [HKEY_LOCAL_MACHINE\Software\Reuters\RFA]. Any namespaces found here (other than the Default) will be listed as User Config Databases. When using flat files (see next section) instead of the Windows Registry, any namespace other than the Default must have a separate file with a .cfg extension residing in the same directory as the default configuration file. The name of the namespace must match the name of the configuration file. For example, 'namespace1' is the name of the namespace in namespace1.cfg. The list of databases will automatically populate based on the files found. Refers to the rtconfig file option “rmds2_UseConfigFile”, which specifies a file containing the RFA configuration settings. By default, the engine looks for configuration information in the Windows Registry. Refers to the rtconfig file option “rmds2_KeepStaleData”. When this option is selected, RTD cells will retain their values even though the RTW RMDS (RFA) engine has been notified that the values are no longer valid (i.e. they have become stale). The “data stale” message will still be displayed in the status window. When this option is off (the default), cells referring to stale data will display N/A. Selecting the Advanced button opens a second, tabbed dialog box called RTW RFA Configuration, which is an interface to the RFA Windows Registry settings or a specified flat file. For more information, see RTW RFA Configuration Editor below. Go to Start → All Programs → Microsoft Office. Right-click on Microsoft Excel 2010. Choose Properties → Compatibility (tab). Under Privilege Level, select Run this Program as an Administrator. Click OK and start Excel. 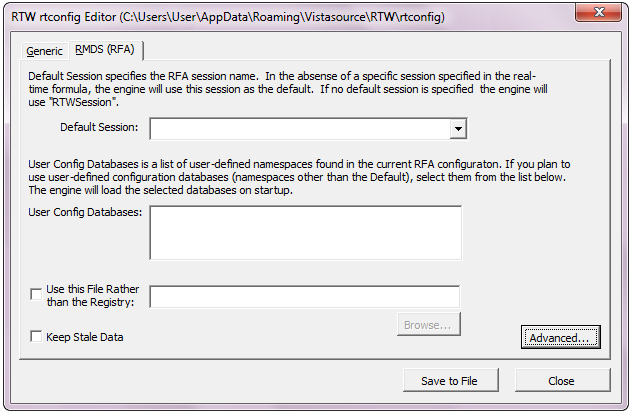 The RTW RFA Configuration Editor is used to manage RFA namespaces (configuration databases) and their respective components. Based on your setting for “Use this File Rather Than the Registry”, the RTW RFA Configuration dialog box provides an interface for editing the RFA configuration in either the Windows Registry or a specified flat file. The RFA Configuration Editor only reads the RFA configuration components and their respective fields. It does not read custom component names or fields. When using a flat file, it also does not read lines that have been commented out. In Excel, select Vistasource → Settings → Rtconfig Editor. Click the Advanced button. If the button is greyed out, see Advanced for details. When using the Windows Registry, you will be prompted to create an RFA default configuration if one does not already exist in the Registry. When using the Windows Registry, the Save, Remove and Rename buttons directly and immediately edit the Registry. When using a flat file, the Save, Remove and Rename buttons only make modifications in memory. In this case, the Save to File button must be used to actually write the changes to the file. See below for some specific examples. To close the RFA Configuration Editor, click Close. If there are any unsaved changes, you will be asked whether you want to save those changes. Similarly, if there are unsaved changes in a table, and an action on the dialog would cause the table to refresh, you will be asked whether you want to save your changes. Examples of such actions are: changing a component type, changing a component name, or changing a namespace name. Some of the RFA configuration components are detailed below using the SSLED example setup from the RFA-example.reg and RFA-example.cfg files. For more information about all of the RFA configuration components, please contact Thomson Reuters for the Robust Foundation API, v7, C++ Edition, Configuration Guide. We strongly recommend that only system administrators or experienced users edit these advanced RMDS RFA configuration options. When using the Windows Registry, this name corresponds to the Reuters\RFA\Default entry in the Registry. When using a flat file, the name corresponds to the file specified in the “Use this File Rather than the Registry” setting. You can define new namespaces or edit existing ones. When using flat files, user-defined namespaces correspond to file names on disk (see below for more specific information). Verify that ‘Default’ is listed in the Namespace option box. Modify the individual configuration components by choosing the appropriate tabs and editing the settings. Enter the new name in the Namespace field. When using the Windows Registry, click Save Namespace. A new key will be written to the Registry. When using flat files, click Save to File. A new file will be created in the same directory as the Default namespace file, using the name of the namespace and the extension .cfg (e.g. namespace1 corresponds to the file namespace1.cfg). By saving a new namespace name, you do not create an entire configuration tree. Define the individual configuration components for this new namespace by selecting the tabs and entering the relevant information. For user-defined namespaces, only Connection and Session components can be defined. 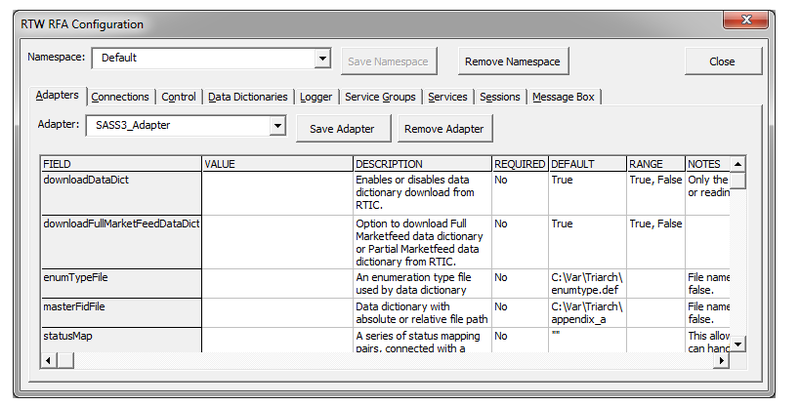 Select the namespace in the Namespace option box. A dialog box opens with a message that all entries for that namespace will be removed from the registry. The RTW sample configuration sets up a Default namespace with various components. These components are detailed below using the default RTW session as an example. A session is a configuration context that the engine uses to connect to RMDS. The default RTW session is called RTWSession and is defined to have an SSLED-type connection. A minimal configuration must include at least one Session component and one Connection component. Select RTWSession in the Name pull-down menu. Type a session name in the Name field. Select a session name in the Name pull-down menu. Type the new name in the RTW RFA Rename dialog and click OK.
As noted above, when using flat files the Save, Rename and Remove buttons only make changes in memory. Click Save to File to actually write the changes to the file. On the Connections tab, you can choose to edit, rename or remove an existing connection, or create a new connection. Connection settings are specific to your environment. Select Connection_SSLED in the Name pull-down menu. Note: The Type pull-down menu will show SSLED. Each connection must have a connection type defined. Enter the port number in the VALUE cell of the portNumber field. Enter the server name (IP address) in the VALUE cell of the serverList field. If the DACS username is different from the Windows login name, enter the user name in the VALUE cell of the userName field. Otherwise a user name is not required. Some connection types have their own logging mechanism. Logging can affect performance, so use these settings for debugging only. Enter True in the VALUE cell of the logEnabled field. Enter the maximum size for the log file in the VALUE cell of the logFileSize field, e.g. 10000. Enter False in the VALUE cell of the logEnabled field. An adapter is an RFA library and configuration context that corresponds to a connection type. As such, there is a fixed list of adapters, one for each connection type. Each adapter type has its own settings with their corresponding default values. Use the Adapters tab to specify settings that are different from the default. For example, in the RTW sample configuration the setting for downloading the data dictionary (downloadDataDict) has been turned off. Create a directory under C:\ called var. Create a subdirectory under var called triarch. In Windows 7, browse to C:\Program Files(x86)\Vistasource\RTW\4.5\ and copy the files appendix_a and enumtype.def. In Windows XP, browse to C:\Program Files\Vistasource\RTW\4.5\ and copy the files appendix_a and enumtype.def. Services refer to the various services provided by your RMDS system. By default, there is no need to set this component because services are obtained dynamically. However, RTW will use the services listed here in dialog boxes where a service entry is required. In addition, the infrastructureType field of the Service component may be required to specify sector guessing when subscribing with 2-part subject names in a SASS3 connection (for example, FOO.O may need to expand to SH.REC.FOO.O, in which case the infrastructure type would be set to TIC).The sample configuration files have several default services defined: DTS, IDN_RDF, IDN, SH. Type the new service name in the Service entry box. Select a service name in the Name pull-down menu. The Data Dictionaries tab is used for specifying data dictionary types. 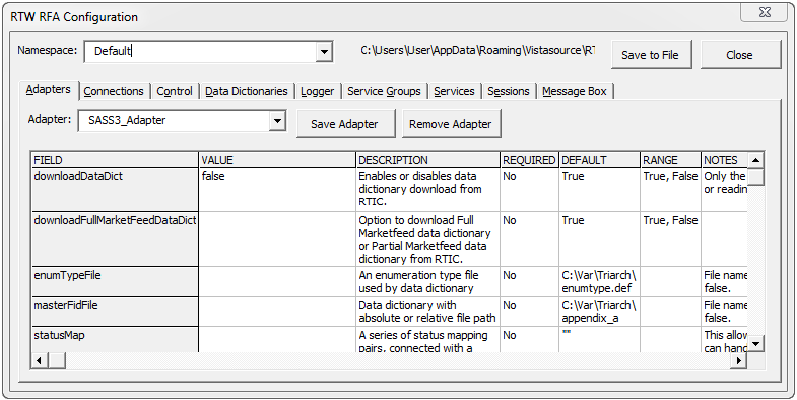 The data dictionary name is used in the Services component option “DataDictList”, and the type is used by the RTW RMDS (RFA) engine to determine which data dictionary to request. In this way, the engine knows which data dictionary type to request for each service. To view and edit these settings, select the Data Dictionaries Tab. To view and edit these settings, select the Control Tab and click on the Entitlements toggle button. Depending on the connection type, the RTW RMDS (RFA) engine can either publish or contribute. With the SSLED connection type, only contribute is supported. With the SASS3 connection type, both publish and contribute are supported, but not within the same session. When using a session with a SASS3 connection type, the RTW RMDS (RFA) engine will decide whether to publish or contribute based on whether the connection has contributorRV or publisherRV set. If both contributorRV and publisherRV are set, then the publish setting will override the contribute setting. When publishing market data (as opposed to contributing) the record name must be a four-part subject name. For more information about how to use publishing, see Publish. The following sections show different configuration examples using the RFA example flat file (RFA-Example.cfg) and the RFA example registry file (RFA-Example.reg). Choose whether you want to use the Windows Registry or a flat file. If you are using a flat file, skip to step 2. Otherwise, initialize the Registry with the provided example registry file RFA-example.reg which is located in the install directory, e.g. C:\Program Files (x86)\Vistasource\RTW\4.5. Note: For the remaining steps, Windows 7 is assumed. Launch the RTW RMDS (RFA) Configuration Editor. Select the RMDS (RFA) tab. If you are using a flat file, check the “Use this File Rather than the Registry” box and browse to %USERPROFILE%\AppData\Roaming\Vistasource\RTW\RFA-example.cfg. If you are using the Registry make sure the box is unselected. Click on the Advanced button to launch the RTW RMDS (RFA) configuration editor. If the button is greyed out, see Advanced for details. Select Connection_SSLED in the Name option box. Note that the Connection Type is set to SSLED, and that the following fields are filled out: PortNumber, ServerList, username. Note: A username is only required if the DACS username is different from the Windows login name. Delete this entry if it does not need to be set. If necessary, logging options for this connection can be defined here. Logging can affect performance, so use these settings for debugging only. The options are: logEnabled (True/False), logFileName (e.g. “%TEMP%\ssled.log”), logFileSize (e.g. 100000). Select SSLED_Adapter in the Name pull-down menu. When using flat files, also click Save to File. Browse to C:\Program Files(x86)\Vistasource\RTW\4.5\ and copy the files appendix_a and enumtype.def. If you are using a flat file, check the “Use this File Rather than the Registry” box and browse to %USERPROFILE%\AppData\Roaming\Vistasource\RTW\RFA-example.cfg. If you are using the Registry, make sure the box is unselected. Ensure that the default Session is SASS3Session by choosing it in the Default Session pull-down menu. Click on the Advanced button to launch the RTW RMDS RFA Configuration editor. If the button is greyed out, see Advanced for details. Select Connection_RTIC in the Name option box. Edit the already-defined RV connection, Connection_RV5. The RV connection needs to specify the values that reflect your environment (see Quick Setup above for more information on these values). To change the values for Connection_RV5, select Connection_RV5 in the Name option box. Enter the appropriate values for the daemon, service and network fields. Select SASS3_Adapter in the Name pull-down menu. Browse to C:\Program Files\Vistasource\RTW\4.5\ and copy the files appendix_a and enumtype.def. Note: Services are obtained dynamically, but service names are required for the User Interface Dialogs. Make a copy of the existing RFA configuration file, usually C:\Program Files\Reuters\Common\Config\RFA.RFA-configuration-file. In Microsoft Excel, select Vistasource → Settings → Rtconfig Editor. Select Use this File Rather than the Registry. Specify the path to your copy of the RFA configuration file (from step 1). Set the RTW default session to the session you want to use from the RFA configuration file. This is typically called “XtraSession” and can be selected from the “Default Session” list. At this point, your configuration may be ready to use. There are some cases, however, where further edits may be needed. Base names (.e.g. RFA6_Adapter) must have the correct RFA prefix (e.g. RFA7_Adapter). Full names (e.g. RFA6_Adapter71.dll) must have both the correct RFA prefix and suffix (e.g. RFA7_Adapter80.dll). The above edits can be made either manually or by using the RTW RFA configuration editor. See RTW RFA Configuration Editor for more detail. Verify your PowerPlus Pro configuration file, it may link to other configuration files, in which case you should also copy these files and modify the paths in the configuration file before removing PowerPlus Pro. If your configuration is not working or additional assistance with migration is needed, please contact support@vistasource.com.